There was a time, not too long ago, when people used to avoid buying cars in Nov and Dec. The year end used to be a complete dud for the Car Co’s. 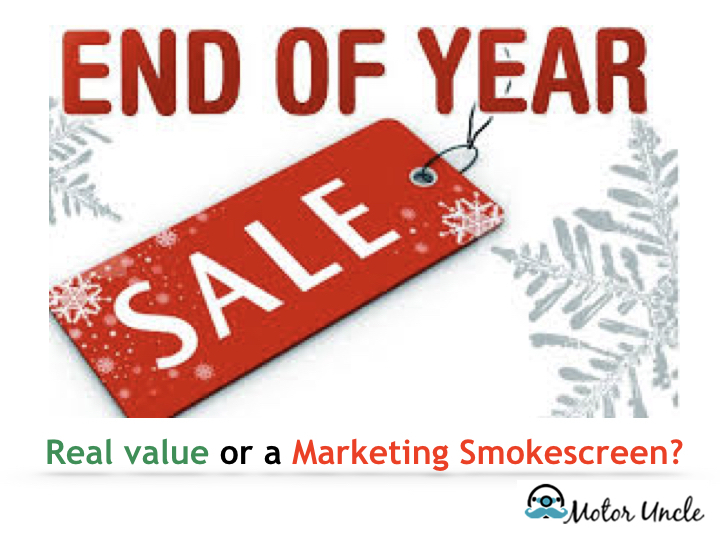 Attractive Year End Discounts, which now get advertised. Earlier they used to be passed on covertly, as if hiding a sin! Yes the Discounts are very attractive. However the fact remains your car gets older by an year in a few days. Now what does that mean. Your Car’s Registration Certificate ( RC) has two dates viz Date of Registration and Manufacturing Year. There can still be a respite if you buy the 2017 Manufactured model in 2018 Jan as the date of registration would be 2018. So atleast one date is of the new year. It can form a basis of negotiating a deal later when you sell your car. What does it mean for the Small Car Buyer ? India is a Small Car Market Paradise. If you buy a small car in Dec and sell the car in 3 years, Boy, you have in all likelihood just shortchanged yourself! The Dec Marketing Glitz just got you! You have lost money maan!!! The car experts say the small car depreciates each year by 10-15 %. However the Indian blue book data says otherwise and its based on lakhs and lakhs of transaction. If we take the data of Maruti Swift, the difference in depreciation amount between 3rd Year and 4th Year is 1 Lakh. Now You would not have got that much discount in Dec. Even if you got 50K discount which is also on higher side, you just lost a cool 50K to Dec sale Hype! Where it can make sense? If you plan to buy an aged model of a luxury car or high end sedan, which has been sitting at a dealership for a few months, you can really crack a deal as the dealer would be paying interest on it, through his nose and he would want to get rid of it at any cost! The offer on such vehicles would mostly defeat the depreciation amount. However my fav bet is taking delivery in Jan on a Car manufactured in Dec, That’s when the dealers open their floodgates for discounts and you get atleast one date of 2018 on your RC, which you can leverage for negotiation later when you sell this brand new beauty! and yes keeping your car in good condition, serviced well, would always get you the best ownership experience and great deal thereafter! and yes never forget to belt up and always Dip your lights! So begin the hunt for your fav car followed by a memorable Dealer Experience, right here at MotorUncle.com! Disclaimer : Read what I say but apply your own mind as every situation and car is different! ← How to buy a Car without Confusion ?